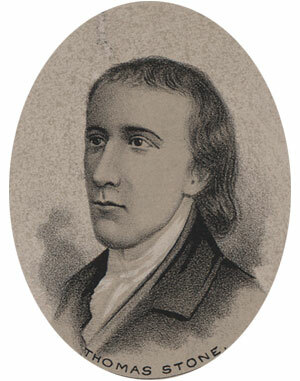 Stone was elected to Congress in 1775. He did not speak much in congress, so little is known of his service there, except that he was a member of the committee that framed the Articles of Confederation. He voted for Independence in 1776, and his name is affixed to the Declaration. He was elected to Congress again in 1783 and served as chairman, but retired at the end of his term. He was elected to attend the Constitutional Convention in 1787, but declined the office because of his wife's failing health. She died 1787, and Stone never got over the grief. He decided to travel to England, but died in Alexandria while waiting for the ship. He was forty-four years old. Little else is know about Thomas Stone, as no letters or papers accounting his life have ever been found.